LOS GATOS, Calif. — As a Cuban-born, Puerto Rican-raised success story who has lived the American Dream, Carlos Alonso has enjoyed many a happy new year. Yet it will be tough to top the one that Alonso, a high-tech executive, and his wife Monica experienced 15 months ago in Pasadena as they watched the second of their three sons blaze a rosy trail toward redemption. Sitting in the Rose Bowl stands on Jan 1., 2012, Carlos and Monica became emotional as son Kiko, a junior who was splitting time at inside linebacker for the Oregon Ducks, became a major thorn in Wisconsin quarterback Russell Wilson's thigh pads. With a diving, momentum-shifting interception late in the third quarter, a fourth-down sack and 2 ½ tackles for loss, Alonso earned defensive MVP honors in the Ducks' 45-38 victory — and turned his proud parents to mush. "We were in tears," Carlos recalled Thursday as he and Monica joined Kiko, a rising NFL draft prospect, in the pleasant backyard of their home in an idyllic San Jose suburb nestled below the Santa Cruz mountains. "We've never questioned [Kiko's] character, because we know who he is. Even with all the things that went on, and the fact that there was all that baggage — and some of it was justifiable — we knew what kind of person our son is. For him to have that kind of game, what a moment it was. It was almost a destiny thing." 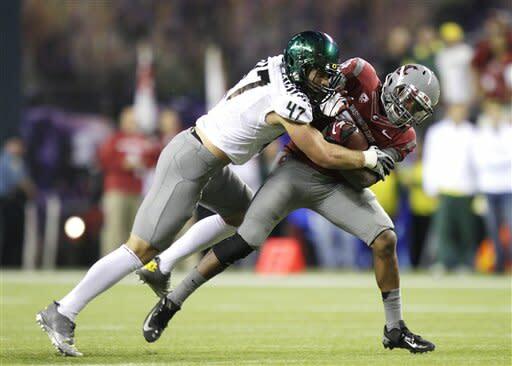 As it turned out, the first day of 2012 was also the first day of the rest of Kiko Alonso's football life. "That was his coming-out party," says Philadelphia Eagles assistant defensive backs coach Todd Lyght, a former Ducks assistant who followed head coach Chip Kelly to the pros earlier this year. "The kid is a machine, and he is tough as nails." Buoyed by that breakout performance, Alonso put together a stellar senior season to position himself for a legitimate shot at an NFL career. He's expected to go anywhere from the second through fourth round of next week's NFL draft, completing a path to the pros that once was obscured by significant roadblocks. Two years ago, during a visit to watch their son play in Oregon's spring game, Carlos and Monica woke up in the apartment near campus that Alonso shared with teammates Dion Jordan (a projected top-five pick) and Josh Kaddu [now a Miami Dolphins linebacker) and asked, "Where's Kiko?" They eventually got their answer — in the form of a phone call from Lane County Jail, where their son had been charged with burglary, criminal mischief and criminal trespass. "Now, it seems funny," Monica said. "It didn't then." In addition to a sentence of two years' probation and 200 hours of community service, Alonso was punished by Kelly, who suspended him indefinitely. At that point, he was out of chances: Having been arrested the previous February for driving under the influence — just hours after Kelly had announced a get-tough policy in response to his team's run of off-the-field troubles — Alonso (who later tore his ACL) had already served a suspension for the entire 2010 season. "I knew I had to do it. It was easy. I just occupied myself with training, staying away from it. It's really simple. You just really have to put it behind you and move forward. That's all I really did. I just didn't look back. I just did what I had to do. I'm still doing what I have to do." Over the past several months, Alonso has done everything he can to convince NFL talent evaluators he's pro material — with largely successful results. "He's a better athlete than people give him credit for," one scout for an AFC team says of the 6-foot-3, 238-pound Alonso, who ran the 40-yard dash in 4.72 seconds. "At Oregon, he showed he could cover. He showed he could blitz. He's big, long and versatile, and I think he's better than [Notre Dame star] Manti Te'o for sure." Said a scout for an NFC team: "He's a physical, tough SOB. He's fearless. He's a good blitzer and can cover tight ends man-to-man better than most. And he had a lot of production, even against spread teams. When he won the Rose Bowl against Russell Wilson, he never looked back. He was arguably their best player last year, because remember, Dion Jordan got hurt. People say that Oregon's defense was soft, but they were crushing people. He played a big leadership role on that team." It's unclear what role Alonso will play in an NFL defense, given that various teams project him as an inside linebacker in a 3-4 scheme or anything from a Mike (middle), Will (weakside) or Sam (strongside) linebacker in a 4-3. There's a healthy debate as to whether Alonso is a true three-down linebacker or someone who'd likely have to come off the field during obvious passing downs. "I think he's definitely [a three-down linebacker]," says an NFC head coach. "He's tough, disruptive and has good instincts." Others aren't so sold on Alonso, citing weaknesses such as a lack of top-end speed, a tendency to slip away from blockers (rather than take them on at the point of attack) and a penchant for over-pursuit. "Sometimes, when he goes for the knockout shot, he'll fly by," the NFC scout says. Complicating the picture is the reality that this is tough-to-gauge class of linebackers in general, headlined by Te'o, who is no longer regarded as a slam-dunk first-round prospect. With some teams sure to shy away from Te'o because of concerns ranging from his highly publicized catfishing episode to his poor play in Notre Dame's BCS title game defeat to Alabama, and with many talent evaluators convinced that Georgia's Alec Ogletree is better suited to play outside linebacker in the pros, Alonso is popping up on some draft boards as an enticing option on the inside. Other considerations are Kansas State's Arthur Brown, LSU's Kevin Minter and Florida's Jon Bostic. If nothing else, Alonso has been vetted more than most of his peers. In addition to meeting with numerous teams at February's NFL scouting combine, he made subsequent visits to seven organizations: The Saints, Bears, Vikings, Patriots, Titans, Chargers and Raiders. (He also attended the 49ers' pro day for local collegians earlier this week.) He staged a private workout at Los Gatos High School, his alma mater, for Atlanta Falcons general manager Thomas Dimitroff and other team officials, and the Dolphins, Cardinals, Jaguars and Chiefs were among those who sent coaches to watch him at Oregon's pro day. All of this means that Alonso has answered questions about his past transgressions — and, in particular, the embarrassing arrest which put his football career on the brink of extinction — over and over again. "After about 10 minutes, they told me. And I was like, 'Oh [expletive].' "
Suffice it to say that Alonso's parents weren't especially thrilled, either. "It was obviously a hard time," says Monica, who is from Colombia. "What was especially hard is that people viewed him in a negative way, when there are so many positive things about his character. Kiko's quiet, but he's a very kind person. He became friends with one of the ladies who served food at [Oregon's training table] — he'd practice Spanish with her, and she took him to church. And he'd leave her tickets to the games. She told me that in all her years at the school, he was the only player who ever did that." Kiko's father is equally proud of his son, though Carlos does have one misgiving. "Being from Cuba and Puerto Rico, he loves baseball, and he was pretty bummed when I stopped playing," said Kiko, whose older brother, Carlos Jr., is an infielder with the Phillies' Class A affiliate in Clearwater, Fla. "But once I started playing football in ninth grade, baseball just became boring. My dad was mad — daily, he'd try to change my mind. I said, 'I just don't like it anymore.' "
Carlos laughed at the recollection, saying, "I'll tell you this: I'd love to get him out there now, just one time. He'd probably hit the ball 500 feet." Instead, Carlos can look forward to watching his son put big hits on quarterbacks, ball-carriers and receivers next fall — and, if all goes well, many more happy new years to come.